Everyone’s favorite killer doll is back! 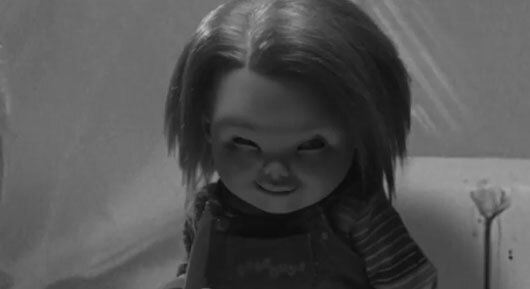 And not only is he starring in Curse Of Chucky, the latest installment of his popular Child’s Play franchise, but Chucky is also invading some other horror films. Check out the videos here below where the foul-mouthed, red-head diminutive killer bursts into movies like Psycho, Sam Raimi’s Drag Me To Hell, and Mama. Brad Dourif, who has provided the voice of Chucky throughout the franchise, returns for these videos as well. Curse Of Chucky was released this week on DVD and Blu-ray. Also out on Blu-ray and DVD now is the Chucky: The Complete Collection box set, which contains all 6 Chucky films: Child’s Play, Child’s Play 2, Child’s Play 3, Bride of Chucky, Seed of Chucky, Curse Of Chucky.